Here is an interesting newcomer, to me at least. It’s a pity the presentation is so slipshod in this, his debut song-CD. All we get is a double-fold sheet with bios of Dahlmann and his excellent accompanist Charles Spencer and on the back of the jewel-case there's a track-list. There are no texts and translations, no comments whatsoever on the songs. This side of things is certainly rather uninspiring. A mistake in the track-list is unfortunate: track 9 is given as Auf dem Strome, D. 943 (text Rellstab), but is in fact the much earlier Der Strom, D. 565 to an anonymous text. I have given the correct information above. On the credit side I must mention the generous playing time – 77 minutes; you get a lot of music for your money. Even more important – you get an accompanist of the highest rank and a voice with many of the attributes that make for a good Lieder singer. My first impression of Thilo Dahlmann is his care over nuance. He is basically a rather light and lyrical singer and works within a fairly narrow dynamic range. He rarely sings stronger than mf and his readings of the first couple of songs are relatively reticent. Fast passages can sound clumsy although he is careful in his phrasing. At forte, as in Grenzen der Menschheit (tr. 3) he is heavy, but it turns out after a while, that it is the more dramatic songs that are his real strength. Prometheus (tr. 4) is strong and powerful and he is expressive with Fischerweise being lively and sensitive. Schiller’s Gruppe aus dem Tartarus (tr. 11) finds him at his very best, powerful and intense. He certainly has impressive low notes and takes the optional low D on the final schlafen in Der Tod und das Mädchen (tr. 16), so he should rightly be labelled bass-baritone. Totengräbers Heimweh is also accomplished. 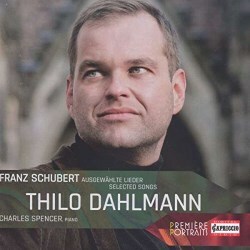 Thilo Dahlmann is firmly established in Central Europe, as a concert singer, recitalist and opera singer. His discography is also budding and knowing that one of his teachers was Ulf Bästlein, who contributed a good Goethe disc to the complete Naxos cycle of Schubert songs some fifteen years ago, I feel confident that we will hear more from him in the field of Lieder. There can be no complaints about the recording but it is still a pity that Capriccio chose to issue the disc with minimal documentation. Dahlmann and Spencer are worth hearing even so.